We are a non-profit organization whose aim is to share with you a few instants, the span of some breaths, in harmony.. Be it through the discovery of a dance step, a Taiji form, a Yoga posture or even an exotic mouth-watering flavor, do come and try the experiment! We cannot separate yoga from life. Because yoga happens in every moment, or there are chances for unity in every moment. But when we are far from nature, actually we are far from our own self, we are far from truth and peace. So we are planning to use the earnings of our organization to build huts for yogic sadhanas and a yoga shala for group yogasana and meditation practices, and to promote organic agriculture and support those who are already on this path. Let the yogis and yoginis in different parts of the world do spiritual sadhana together. Do karma yoga by staying close with nature as a farmer supporting organic agriculture. Our third aim is to give right education to children, inspiring them to be a Human Being: One who understands the value of our traditions and cultures, One who respects our ancestors, One who is happy to love nature without any selfishness, One who is ready to accept heart fully whatever comes ahead. Amandine has been a lover of martial arts and performing arts ever since childhood. She first climbed on stage at age 7, taking part in several dramas in various cities of Europe with the company "Le biscuit qui craque". During her schooling, besides continuing drama classes, she learned gymnastics, karate, aikido and Thai boxing. Yet only when she discovered Kalaripayattu (the ancient martial art from Kerala, South India) through a TV documentary, at the age of 15, did Amandine feel she had found what she was looking for. From then on she dreamt of flying to India to immerse herself into that incredible universe. 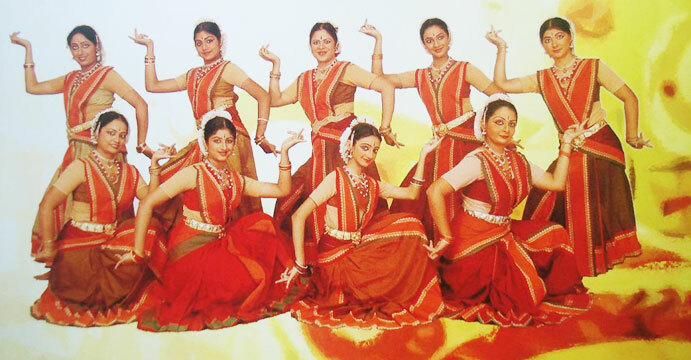 she started learning Bharatha Nathyam (South Indian classical dance) with Lalitha, and literally fell in love with it. Later, in parallel to her engineering studies at SUPMECA Paris, she could attend Kalaripayattu classes with Cecile Gordon, one of the rare masters in France teaching this art at the time. Her passion for Indian classical dance also deepened thanks to the wonderful teachings of Dominique Delorme, whom she had first met through a week workshop in 2001. Finally, in 2006, her engineering college gave her the opportunity to fulfill her longtime dream: to fly to Chennai, South India, where she was blessed to meet and learn from her dance guru Dr. Padma Subrahmanyam, while pursuing her postgraduate studies at IIT Madras. In Chennai, she even got the chance to continue learning Kalaripayattu with Shaji John. She also took up daily yoga classes in order to increase flexibility and develop energy. In 2008, she got awarded the Egide & ICCR scholarship for Bharatha Nrithyam. In the same year, showing fast progress and exemplary assiduity at her yoga center, she was offered a scholarship by the Sivananda Yoga Vedanta organization to attend a Yoga Teacher Training in Madurai, South India. There she met Baburaj, now her husband. From 2009 to 2011, Amandine taught yoga at the Sivananda Yoga Vedanta Center, but also to her college mates and in an orphanage in Chennai. She also took part in several dance dramas with the Nrithyodaya company and performed Kalaripayattu shows with Shaji John. In 2011, a next stage in her life and learning began, as she left India to land in Hong Kong, where she discovered Taijiquan, thanks to Sze Shifu. 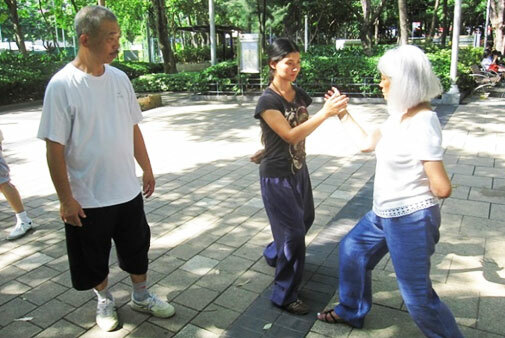 Taijiquan came as a proper continuation of her practice, feeling the need to slow down in order to get a better understanding of the mind and body, and the forces at stake in every movement. Life then took her to Thailand, where she met her Taiji Master, from whom she has been learning ever since. She has also kept sharing her knowledge of yoga and dance with students of all ages and all origins, both in Thailand and in Laos with the Luang Prabang Yoga community. Now, after 8 years of enriching life in Asia, Amandine has come back to her origins in South of France, with the endeavor to share her knowledge with the people who enabled her to live up all her childhood dreams… She will be in charge of the regular yoga, taichi and dance classes, and will be delighted to cook yummy vegetarian food for you if you wish to! Master Baburaj offers all his achievements in yoga and life at the feet of Sivananda paramahamsar of the Vatakara Sidhashramam (in Kerala, South India), whom he considers as his guru and who attained Mahasamadhi (leaving the body at the time of final enlightenment) in 1960. He was initiated to the tradition by Murugan Swami of the Palani Sidhashrmam. For last around twenty years he has been in a true sense a Yogaacharya (Yoga master) practicing the principles of Yoga with a greater command over Asanas (Yoga postures) and Pranayama (breathing techniques). Though he developed himself by own hard work (Swadyaya), the trainings from Thrissur Yoga Association and Swami Vivekananda Yoga Anusanandhan, Bangalore helped him to attain excellence. Later he completed the Teacher Training Course from Sivanandashram, Madhurai, South India, in the year 2008..
Kerala State Winner in 2004, second price in International yoga championship held at Pondichery in 2009 and sixth price in International yoga championship held in Madurai in 2009 are some of the medals which came his way. After many years of practice and conducting countless classes in India he headed off to Thailand and worked in Bangkok and Pattaya with M/s California wow Xperience Co. Then he worked in Vietnam and afterwards in the most famous Yoga center in Russia- "The Kerala Center" in Moscow. Following that, he worked as a yoga teacher in Kiev, Ukraine making his international experience to a total of more than seven years. In between his international career he used all his vacations to be the main pillar of several Yoga alliance certified Teacher Training courses and Advanced Teacher Training courses where he had students from all over the world. Presently he has become a member of Yoga Ayur Meditation organization, which provides high quality Yoga Teacher Training Courses with a particular focus on ayurveda and meditation. Master Baburaj is also skillful in Taijiquan and won Bronze medal in the International Taiji Championship in 2009 held in Bangkok. He is also a Master Degree holder in Reiki, Usui style. 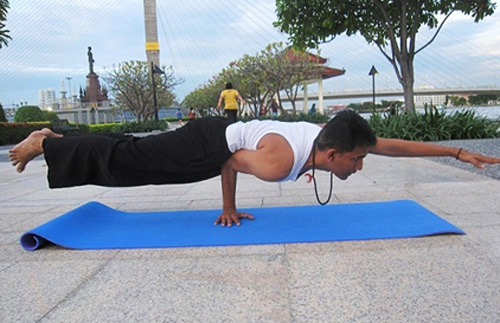 He is internationally famous for his unique style in conducting the yoga sessions which creates a lot of interest and enthusiasm in the students.